Captivating movies are like dreams. They offer a break from our ordinary lives, a release from the stranglehold of mundane concerns, and a passport to fascinating worlds that exist only in imagination (or do they?) This is all certainly true of James Cameron´s spectacular 2009 film. Employing state-of-art digital effects, motion-capture photography, and other cutting-edge cinematic technologies, many developed just for this movie, Cameron and his team of artists, designers, and technicians created a lush world of breathtaking beauty, like nothing that had ever been seen on a widescreen before. More than a dreamlike escape, Avatar is also an allegory for events in the real world. Critics and commentators have been drawn into heated debates about the movie´s presentation of a wide range of cultural, social, political, and religious themes. Avatar is a feast for the eyes, but it also offers much food for thought on issues such as the health of our planet, imperialism, militarism, racism, corporate greed, property rights, the plight of indigenous peoples, and eco-friendly spirituality. Just as Jake´s rendezvous with the Na´vi and his experience of the astonishingly rich panoply of strange biota found on Pandora awaken him to a new view of the world while simultaneously reshaping his loyalties and priorities, so too our experience of Avatar can help us to see the real world more truly and perhaps even inspire us to change it for the better. “Everything is backwards now,” says Jake at a crucial point in the movie. “Like out there is the true world and in here is the dream.” “Out there” is the world of the Na´vi, with their deep reverence for life and their wisdom about how to live sustainably. “In here” is Hell´s Gate – the sterile, artificial world fabricated by greedy human beings who have forgotten how to live in harmony with nature. Clearly Cameron is encouraging us to see the environmentally destructive aspects of modern industrial civilization as products of a deluded worldview, as a bad dream from which we might be awakened. Sorting out dreams from reality has long been a preoccupation of philosophers. But Avatar also provides fodder for reflection on the most contentious moral and political issues raised by the movie, addressing topics such as environmental ethics, colonialism, war, and the conduct of corporations, questions concerning the relationship between mind and body, personal identity, the possibility of truly knowing an alien civilization, empathy, aesthetics, science, technology, religious attitudes toward nature, and our experience of the world of movies. Could tsaheylu (the bond) really be possible? Is the mind something that can be transferred from one body to another? Are trees really “just goddam trees”? Or might there be more to the world than we can know through the methods of empirical science? So, the movie owes its thunderous success a paradoxical interplay between nature and technology. On one side the viewers are moved by the vigorous moon Pandora and its inhabitants, the Na´vi, a race of blue, three meter tall noble savages, who live in spiritual and ecological harmony with nature. On the other hand we have the humans, who, with a lot of technology, are on the moon in order to exploit its natural resources for own winning. But, and this is the paradox, to this comes the ultramodern animation and 3D technology, which brings the Na´vi alive on the screen, together with images of Pandora, which are of a beauty seldom seen before in a movie. Man has, with the industrial modernization, cultivated a mind, which can solve almost any technological problem; that, which the german philosopher Jürgen Habermas calls the instrumental reason. But human problems have apparently never been solved. On the contrary mankind are about to be drowned in its problems: problems concerning communication, the relationship with others, heaven and hell. The whole of the human existence has become one extremely complex problem. And apparently it has been like that through the whole of history. Despite the knowledge of Man, despite his millenniums of evolution, Man has never been free from such problems. The solutions to such problems require a communicative reason, a reason which understands the human community. But as Habermas says, then we are not using such a reason, on the contrary we are using the instrumental reason on human problems, where it only should be used on technical problems. We seek to solve human problems technically, where they should be solved in a philosophical way. The systems (the market, the economy, the bureaucracy, the treatment society) have colonized the lifeworld. So, the movie is of interest for environmental activists, who fight for both human rights and environmental rights, and who will save the world through protection of forests and global peace. But the movie is also of spiritual interest. There are some fascinating equal signs with Tibetan Dream Yoga and traditional Shamanism, which not must be confused with New Age though. New Agers have namely already interpreted the movie as a “New Age Movie.” That´s fundamentally wrong. The movie contains a lot of references to the traditional wisdom traditions, but not to New Age (I will return to this in coming preachings on the movie, but you can begin with my article Six Common Traits of New Age that Distorts Spirituality). Dream Yoga is a spiritual night practice where you through certain techniques can develop a so-called astral body, or dream body. With the help of this you can leave your body during your sleep and travel elsewhere, both on this planet and other planets, but also into the so-called astral worlds. These worlds have had many names: it is Plato´s world of forms, the Bardoworlds of the Books of the Dead, the Anabasis of the mystery cults, the image galleries of the Alchymists, the Akashic records, the collective subconscious, the dreamtime of the aboriginals etc. etc. – see my article What is Dream Yoga? This refers to the three forms of states the wholeness can be in: sleep, dream, awake. When the wholeness is sleeping, mountains are mountains and woods are woods. This is the reality of the ordinary consciousness (the Ego-consciousness). The ordinary consciousness can sleep in three ways: 1) the dark sleep which is the Ego´s deep nightly sleep; 2) the grey sleep, which is the Ego´s nightly dreams and other dreams; 3) the light sleep, where the Ego is awake. The three forms of states the wholeness can be in, can also be described as the personal time, the collective time and the universal time. These three states can further more - when we talk about going through them in a spiritual development process - be said to reflect the structure of the education novel. The education novel is especially known from Romanticism. With concepts collected from Goldschmidt´s ”The Homeless” (1853-57) the development process of the education novel can be characterized in this way: at home – the homeless – home. Although great parts of the course of the education novel, are about the homeless phase, we know, that the person very probably shall arrive ”home” again. A more or less pronounced model for all the education novels of Romanticism is Goethe´s ”Wilhelm Meister” (1795-1829) – and which actually, in very symbol satiated form, describes a spiritual development process. Tolkien´s The Lord of the Rings is another example on a description of the spiritual development process. When the wholeness begins to dream – and this happens only, if you set yourself existentially into the process of awakening – then the Ego, or the inner thinker, experiences himself as a flower, which begins to open itself towards the collective time: the thoughts will be lit through, whereby their collective components – sound, symbol, color, structure – will be visible and make themselves current in the image of reality. The clearness from your dissolved and evaporated thoughts and content, will expand the consciousness out towards the borders, behind which the collective common human structures exist. The thoughts become in other words less personal, more common, more collective, deeper, more philosophical. And these, common deep thoughts of mankind, your consciousness can see, by force of its increased clarity, as visions (primordial images, religious images, symbols, teachers, higher worlds, other dimensions etc.). Your consciousness then observes a world-aspect of vibrant, sound-filled energy-fields, which shimmer in symbols and colours. It observes a world of auric colours, archetypical symbols and yantric or other energetical structures. It begins to sense karmic phenomena. Reality expands itself, all things seem different than before, people shine as transparent onions; plants and animals vibrates, cosmos is alive: mountains are no longer mountains, woods are no longer woods. This is the opening of the collective time, which lies on a so-called astral plane. But in a spiritual practice it is the form of the dream-consciousness it is about, not its content. On the plane of the universal images, and therefore on the Now´s plane, the central is the form of the consciousness - the actual consciousness and its clarity and openness. Not the content of the consciousness. In the spiritual practice, the spiritual, and spiritual active, is the consciousness´ course towards its source (the Now, the Otherness). What the consciousness and the mind and the senses are filled by, is of less crucial importance. But the collective time is a very dangerous intermediate area. The temptation to here, either to become afraid, or to experiment with various possibilities (astral travels, clairvoyance, telepathy etc. etc.) is great. It is a very forceful state. Goethe and Dante write about the collective time in ”Faust” and in ”The Divine Comedy”. Tolkien about it in ” The Lord of the Rings”, Ursula Le Guin in ”The Wizard Ged”. The shamans had to dare the journey to the underground kingdoms with their shadow-inhabitants, demons and dead. And they had to handle the journey to the heavenly regions, where gods and goddesses, heros and heroines, accomodated. The mystics had to experience the descent to hell with its belonging devils, fire and sulphur and torment and suffering. And they had to handle get off to heavenly hosts of angels and light-creatures, if the temptation was as difficult to resist as the sexual impact of the devil. The creativity, and the reality-creating ability, is in the collective time set free in fascinating degree. However, you are, in this astral state, still on the plane of the collective images of time, which work in sequences in past and future, and you are in danger ending up in a spiritual crisis. A spiritual crisis is an expression of, that you have followed the positive path out in the collective time, with your Ego, without having done the philosophical preliminary work; that is to say: the realization-work and the ethical training. The Ego will then make you lose your way in the collective time. 1) If the borders to the collective time is broken down or being exceeded out of hand, for example through LSD or through one-sided development techniques, or in shock, the consciousness and the personality will slide crucial out of balance and therefore suffer. The Ego will sideways with its personal identity and life-situation, suddenly experience break in of tremendous astral energies, clairvoyant abilities, visions of mythological beings, good and evil forces, various demons and angels, death and themes of rebirth, unusual light phenomena, messages from supernatural beings, memories from past lives. These experiences will, because that the Ego´s nature has not been realized, be characterized by unreality and division, anxiety of going mad and anxiety of death, or the experience of a total meaningless and dark extinct world. 2) The personality can receive informations through the break in of astral and collective energies, images and symbols: information about, what approaches human beings from outside (from other people, from chance, destiny, life etc.). However, informations through collective images are contradictional and split. Many have therefore been seduced by these colourful experiences and have remained there, with the ability to see the aura, with the ability to create images, to create in reality. When the collective time is used spiritual in genuine sense, then the Ego, in its egoistic isolating and self-affirmative function, steps aside. However, the same forces can be used for other intensions. It can be creative, Ego affirmative, political, demonical and so on. The forces which in spirituality are given to others´ disposal in healing, energy transmission and spiritual information exchange, the same forces can themselves be turned in through the Ego-structures and open creative channels, create super Egos, create political leaders and popular seducers. The problem, or the danger, does not consist in using creativity or auric abilities. It is actually a good idea to formulate the experiences creatively; the danger is, whether the Ego grows and becomes swollen on the world´s positive responses. And if the Ego gains strength, takes the honour, or blows itself up, the transformation-process of consciousness stops, the growth forward towards the goal: illumination and later enlightenment. The pilgrim manifests the monomyth about the Hero´s Journey. In his book The Hero´s Journey the mythologist, Joseph Campbell, the monomyth, or the hero´s journey, is the common template of a broad category of tales that involve a hero who goes on an adventure, and in a decisive crisis wins a victory, and then comes home changed or transformed (see my article The Hero´s Journey). The most appropriate in spiritual practice is in other words to use the dreaming state of the wholeness, to begin to practice the supporting exercises in my first book Meditation as an Art of Life – a basic reader. Focus on yoga, the Relaxationmeditation and the Harameditation, and only keep the other exercises in mind. The most important is the development of Hara, which is fundamental to all wisdom traditions and natural healing professions. If you as a practitioner remember to use such an opening in the wholeness spiritual seen correct, then this can give your total development a considerably lift forward. It is in other words very important that you do not move accent from awake everyday life (for example a good earth-bound job, ordinary people and family) to dreams and sleep, not use drugs or one-sided development techniques which promise you great experiences and abilities (this is actually what Grof´s Holotropic Breathwork does – see my article A Critique of Stanislav Grof and Holotropic Breathwork). You need to have patience. Even for people with a regular and well-ordered practice (2-3 hours every day) there can pass weeks, months or years between the reflections into the awake state of the wholeness. However, if practice is appropriate, the spiritual consciousness will with time automatically penetrate the dreaming wholeness. And if moments of actual awakening are coming, then everything is simple, intensive, present, in the right place: mountains are again mountains, woods are again woods, but without longings, without wishes and desires, without the past, without the future. The mountains are. The woods are. The consciousness is. The Now is. You are at home again, at home in spiritual sense. The concept of Avatar original comes from Hinduism, where it designates the incarnations of the god Vishnu, for example Rama and Krishna, who, by the way, are considered as being blue. So, the main character in Avatar, Jake Sully, could be seen as an incarnation of Vishnu. The deity of the Na´vi is called Eywa. Again, this reminds about a lot of spiritual traditions - and with a communicative view of nature. It is a balancing energy or consciousness, which is in everything. It is a holistic concept, and because the wholeness is a reality then all parts of this wholeness are defined by each other. If there is put too much energy in one part then this unbalance will be contrabalanced by the energy´s swing over in the part´s opposition. We for example know this from the Chinese philosophy of Yin and Yang. We must become Life Artists who dance with the energylaws of nature. We must create balance. If you are on a wavecrest then remember the trough of the wave, if you are in the one extreme of a thought-swing, then remember the opposite extreme. Remember that your energy-radiation recirculates and returns to yourself. Through the teachings of Learning to See, the Life Artist perhaps becomes able to obtain a complete perception of life, without any division and separation. A perception which consists in, that you fully and totally exist; where you are what you are in progress with; where there are no inner spectator, theorist or doubter within you. Learning to See is about seeing the whole thing, everything as a whole (seeing it through her eyes); that is to say: where you in self-forgetful openness are allowing the thing to fill you out. Seeing is a presence of something, which is not hidden. It is a presence of something evidently, something the individual has a clear understanding of. It is a presence of something straightforward, a presence in naturalness. It is a perception where you so to speak become drawn into the thing, and are melting into a unified wholeness, which contains middle, fullness and light (this is what the 3D technology of the movie actually gives a taste of – therefore the importance in Seeing the Movie). Usually this happens in a short glimpse, inconspicuous; what you often describe as intuitive cognition. Suddenly you understand something. There is no causal explanation for it. In the same way, you can look at all the questions of life as a whole, and not as isolated parts. All this is the complete perception, where you not are outside, but in the middle of life itself. And then you truly are a Life Artist (or a Na´vi). The Life Artist must therefore seek to understand the nature of experience, the beauty in observing, in seeing neutral as in a mirror, and in feeling deeply and incisively without seeking to achieve anything. As long as the mind of Man in any way is distorted – by neurotical impulses and feelings, by fear, despair, by self-assertion, snobbery and striving after power – it can´t possibly listen, observe, see neutral (The Sky People Can´t See). But this art of seeing, of listening, of observing, is nothing you just can choose to do, and nor is it a question of thinking, which develops towards something else. This is what happens in meditation, in the passive listening presence. In accordance with the Taoists, the actual thing to be present in passive listening (wu-wei), is the same as to act spontaneous (tzu-jen). Any spontaneous action is an expression of, that there is a passive listening presence, a space between the thoughts. When for instance the Taoist is seeing, that there is fear, he observes it neutral as in a mirror, without saying yes and no, and feels it deeply and incisively, without seeking to achieve anything with it. The actual experience in this passive listening presence, makes the experience free from fear; and that is to act spontaneous. In all this the unknown is at stake; reality or truth. Learning to See is in other words to enter into the unknown. Besides meaning love of wisdom, the word philosophy also means love of the unknown. But a mind which in any way is historical limited by the known, by its own perspective, - the personal and collective images in time, which all fear-conceptions, ambitions, desires and disappointments, are manifestations of, - can´t possibly enter into something, which presupposes discrimination; that is to say: a balanced, harmonic being, who is healthy on both body and soul. Learning to See has nothing to do with concentration, all that which sort under the supporting exercises. Learning to See is itself the art of life. Art of life means that you are present, that you are listening and observing passive with the whole of your being, with your body, your nerves, your eyes, your ears, your mind, with the heart, completely. It is this, which is meant with, that art of life is a philosophical way of life, something, which concerns your complete existence, the whole of your way of being in all the relationships of life. In this complete presence – in which there is no division between the observer and life itself – you can do anything; and in such a presence there is no resistance. Art of life is an attempt directly to discover and experience truth. In order to be able to understand truth you must be exceedingly present in passive listening, and logical, healthy, reasonable; observing and feeling any of the movements of the thought, without evaluating them, and without attempting to achieve anything with it. Then this sense perception in itself is a complete act, and you can thereby be released from the thought, and achieve being-cognition. Philosophy as an art of life is therefore not the chase after a thought or an idea. It is all thinking´s essence, which is to go beyond all thought and feeling. It is, as Plotin said, the thinking´s journey back to its own Source. Not until then philosophy is a movement into the unknown. Learning to See is a voyage of discovery into the known, into your own perspective and history, into the whole of your world of ideas, knowledge, faith and experience, and through discrimination, to be released from it, and thereby to enter into the unknown, into the Source of wisdom (Eywa). On this journey you are in company with Odysseus, Dante, Faust, Neytiri and Jake Sully. 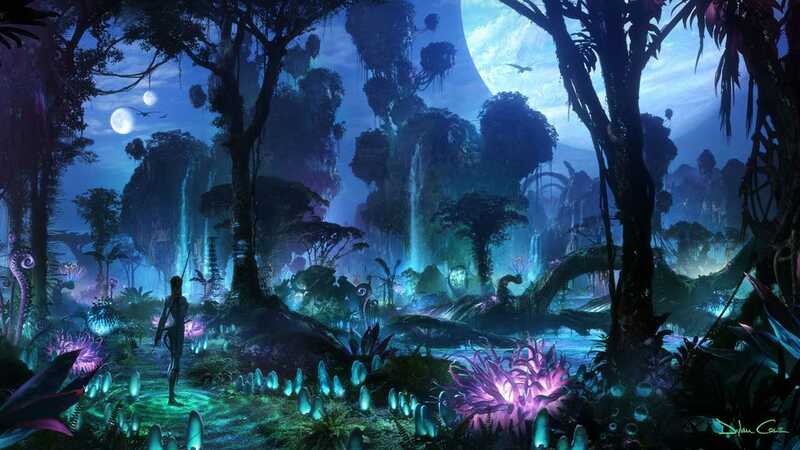 James Cameron is currently working in New Zealand on three sequels to Avatar, which will further explore the Pandoran biosphere and, according to early reports, will introduce a new indigenous undersea culture dwelling in Pandora´s oceans. These new films will make use of pioneering methods of underwater motion-capture photography that represent a major leap forward in film technology. Another dreamlike extravaganza – endowed with the power to provoke a response that is at once visceral, emotional, and intellectual – surely awaits. If we only focus on the visual aspect, though, we´ll miss more than half the picture. We need to keep our mental muscles in shape to think about the philosophical implications of Pandora. So, while we´re awaiting for the next installments of James Cameron´s epic cinematic wakeup call, let´s think over what already have been said. There will come more Pop Culture Files on the movie.